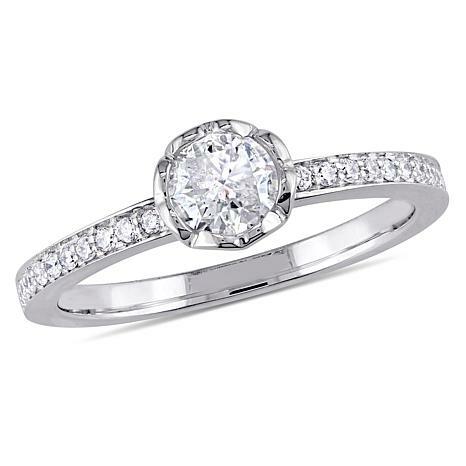 For an engagement ring with demure, feminine style, you can't go wrong with this classic, round-cut diamond ring. It features a sparkling half-carat diamond solitaire cradled in a cup-like white gold setting and shoulders lined with glittering diamond accents. It's the perfect symbol of your love! The diamonds in this piece are graded at G-H color (near colorless) and I2-I3 clarity (inclusions are obvious under 10X magnification). Measurements: Approx. 1/4"L x 1/4"W x 3/16"H; shank 1/16"